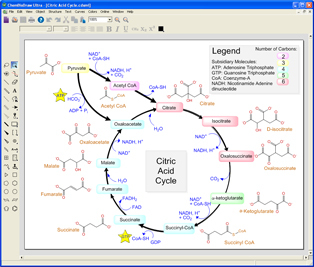 ChemBioDraw is the drawing tool of choice for chemists and biologists to create publication-ready, scientifically intelligent drawings for use in ELNs, databases and publications and for querying chemical databases. Scientists save time and increase data accuracy by using ChemBioDraw to predict properties, generate spectra, construct correct IUPAC names, and calculate reaction stoichiometry. ChemBioDraw is the world’s leading scientific drawing program. Hundreds of thousands of users benefit from its ease of use, high quality output, robust chemical intelligence, rich set of biological tools and integration in the ChemOffice suite and with many third party products. ChemBioDraw includes optional versions of STATISTICA Base for more detailed numerical analysis and MNova Lite for quick processing of NMR spectra right from the chemist’s desktop. It also includes a chemical scripting language ChemScript for automating structure-related processes and linking to other applications. Figure 2: Use an extensive set of templates and drawing objects to create compelling illustrations. 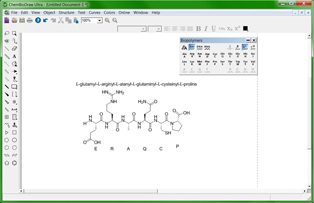 ChemBioDraw provides chemists and biologists with a rich set of easy to use tools for creating publication ready, scientifically meaningful drawings of molecules, reactions and biological entities and pathways and for generating associated properties, systematic names and spectra. The ChemBioDraw® Ultra 13.0 suite provides scientists with an up to date collection of scientifically intelligent applications for chemical structure drawing and analysis combined with biological pathway drawing.